This summer, WCAMP will be conducting a call surveys for American bullfrogs and Green frogs from the beginning of July through August! How to Identify American Bullfrog and Green Frog Calls: Learn to identify the different calls made by American Bullfrogs and Green Frogs through various sound clips and videos. Quiz yourself! Think you know your calls? Test your skills with this mini quiz. We’ve identified certain locations and routes throughout Whatcom County to conduct call surveys. Each route or site has several survey points accessible from the road or by trail. Each site should be visited up to 3 times throughout the season. Once both Green Frog and American Bullfrog presence is detected at a survey site, the survey for that site is complete! Surveys can be conducted any time, but breeding activities typically increase after sunset. Surveying with a partner is recommended for safety, but it can be done individually. Take a look at the map below to see which routes/sites are open, then sign up for the ones you’ve chosen on this form: 2018 Call Survey Site Registration. If you’d rather do some of your own exploring, feel free to find your own survey sites. Simply describe the location or note the coordinates on the form so we can add it to the map. Zoom in to see different survey areas/routes (lines) and their survey points (pins). Each survey area or route will have a specific name with numbered survey points. Blue pins indicate open sites that are a priority for us to survey. Yellow pins indicate other open sites for survey. Red pins indicate sites already taken; if you click on them you will see the results. 1. On the data sheet, record your name(s), the date, environmental conditions, and the survey site number, name, or coordinates before starting your survey. Note: You’ll need to reschedule your survey if there is heavy rain (amphibians cease their calling) and/or high winds (this would affect your ability to hear the calls). 2. Wait 5 minutes before beginning the actual survey. Any disturbances made by approaching footsteps can disrupt breeding activity. The 5 minute waiting period gives the frogs time to resume their normal activities. 3. Survey for a minimum of 5 minutes. Please only record the calls you hear during the survey period. – If you hear calling, record the species you hear and the calling index (1- for one individual calling, 2- for several frogs calling, 3- for a full chorus). 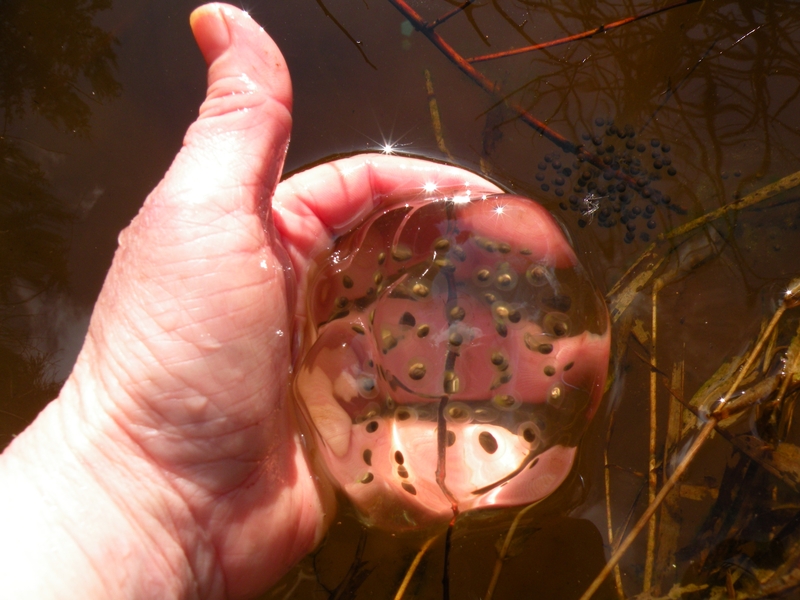 The calling indexd will give us a rough idea of how abundant the frogs are at each site. – The road routes may have more than one wetland at a survey site, so please note if there are calls coming from multiple directions. 5. Once your route or site survey is complete, record any noticeable changes in precipitation or wind since the start of the survey. 6. After you survey as site/route, please fill out this form with the data you’ve collected: Call Survey Data Form. Be sure to fill out all parts of the form to the best of your ability! Tips: If you’re hearing only one of the species calling at a survey site, try your next survey of the site at a different time of day. Bullfrogs and green frogs typically have higher breeding activity during the evening, but will sometimes call during the day, as well, during the peak of their breeding season. If you have any questions about the call survey, you may contact Vikki at vikki@whatfrogs.org.